By the beginning of August, concentration of Luftwaffe forces in France had been fully accomplished, creating prerequisites for the next phase of the German offensive – an all-out attack on British aerial defences. On August 1, Hitler issued Directive No.17, ordering the Luftwaffe to use all its forces to destroy the RAF. The operation was given the code name Adlerangriff – Attack of the Eagles. The long-standing British fear that the German air force was capable of delivering a `knockout blow’ on their country was about to be validated. The following weeks of fierce fighting and attrition stretched the already weakened RAF defences to the utmost. Activity against British shipping lasted for an additional week. On 8 August, the Germans launched the first of a series of mass daylight attacks, so far still with a Channel convoy as their main target. At the radar station at Pevensey, young WAAF operator Jean Semple had her first day on duty. Seeing on her screen a blip of what appeared as a large number of enemy aircraft, she informed her male supervisor and suggested him to take over. His brusque reply did nothing to inspire her confidence. ‘It’s your operation, you do it.’. At this early time, identifying the number of aircraft from a radar blip was rather difficult, especially if they were approaching in large formation. Individual radar echoes were all coming together, distorting the blip with spikes going up and down – a phenomenon known to radar operators as beating. The RAF successfully sent up seven squadrons of Nos. 10 and 11 Groups. Several of them could be directed to excellent positions for attack. At the end of the day, the British claimed 24 German bombers and 36 fighters shot down, while the Luftwaffe decided that they shot down 49 of the opposing fighters. Even if the true numbers were lower, it was the day of the highest scores since the Battle started. Official congratulations followed on both sides of the Channel. The day also provided another example of how valuable the radar detection and control system developed by Dowding was to the defenders. In preparation for the Adlerangriff, the Luftwaffe could no longer ignore its importance. Obviously, something was helping the British squadrons to intercept the incoming raids, even in poor weather. The presence of the British radar was known to the Germans. 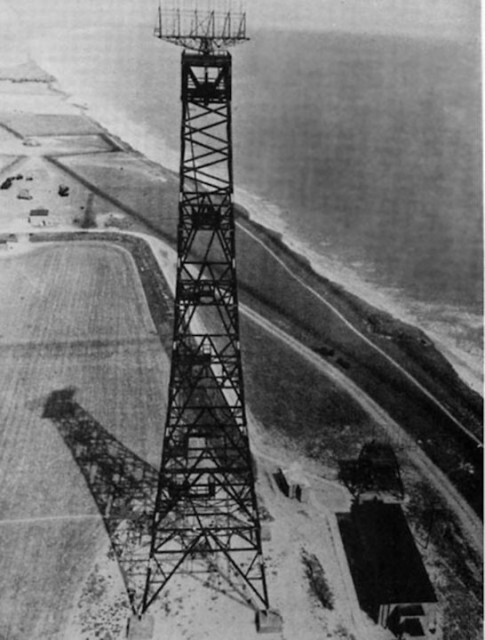 The 360-foot tall radio masts of the Chain Home stations, visible for miles, had attracted the attention of German intelligence services since the days of its first experimental installation at Bawdsey Manor. Initially, the Germans were unsuccessful in recognizing the modus operandi of the British radar, mostly due to the fact that their own radar, technically superior to the Chain Home, worked on much shorter wavelengths. However, during July the Luftwaffe set up radio monitoring units along the Channel coast. Their operators soon identified constant, artificial activity on the 12-metre band. Monitoring voice communications over HF radio also revealed that the British fighters were being directed by ground controllers, distinguishable by their consistently calm and clear voices. It was a misjudgment. Biased by their own radar doctrine, which at the time favoured the use of each radar as an individual unit (such as the one installed by Fink at Cap Blanc Nez, helping him to guide the Stukas towards current shipping targets), the German analysts concluded that each RAF airfield was tied to a single radar with its own, independent ground control. In that they failed to discover the true link between the mysterious masts and voices over the radio. As important as the radar was to the defence of Britain, the true advantage for Fighter Command was in coordinating the data from all Chain Home stations into a single Filter Room. The Filter Room was able to collect, and resolve into a clear picture, what the actual threat was from the numerous, overlapping radar plots reported from various stations. Contrary to the German assessment, it also enabled a single, unified command of all RAF’s fighter resources against the enemy. Fortunately for the Luftwaffe, even this limited study confirmed the significance of the strange Funkstationen mit Sonderanlagen – radio stations with special installations as the masts were called in their vocabulary. As a preparatory operation prior to Adlerangriff, the Luftwaffe decided to put them out of action. 12 August went into history as an anti-radar day. At 9.00, Erprobungsgruppe 210, a specialized Luftwaffe unit operating the novel Bf 109 and Bf 110 fighter-bombers, delivered pinpoint attacks on five radar stations: Rye, Dover, Dunkirk, Pevensey and Ventnor. “It was the Rye radar that picked them up. It was noticed that the track was heading straight at them. The 19-year-old girl operator was slightly irritated by the way in which the Filter Room, at Fighter Command, gave the plot an X code. That meant a report of doubtful origin: possibly friendly aircraft, or a mistake. The radar at Rye was put out of action until power could be restored using a diesel generator – which happened later during the day. The Dunkirk site suffered two huts destroyed and damaged transmitting block, but the radar remained operational. At Dover, some of the radio towers were damaged and some huts destroyed. In Pevensey, one of the bombs cut the main power cable and the whole station went off the air. The Ventnor site, which around noon was further attacked by a formation of Ju 88s, was set on fire and damaged so badly that it was put out of action for two weeks. The precision attacks, although unsuccessful in destroying the masts or underground facilities, tore a temporary 100-mile gap in the radar coverage. Exploiting it, the Luftwaffe launched powerful attacks on convoys in the Thames Estuary and on airfields in Kent – Manston, Lympne & Hawkinge. Portsmouth was also bombed. These attacks caused severe damage; a clear success for the Germans. And yet, RAF fighters were not kept out of the scene. During the morning, defences could be partially directed via the untouched radar station at Poling. During the afternoon, most of the damaged stations were sufficiently patched up to get back on the air, restoring the full operational view in the Filter Room. On the following day, the German signal intelligence service regretfully reported that none of the British stations had ceased its signals. The British even cleverly masked off the demise of the Ventnor station by transmitting identical signal from another station. It turned out to be one of those costly blunders by the Reichsmarshall. The picture does in fact show a CHL low looking radar mounted on a CH type wooden receiver tower. Ventnor was off the for only a matter of hours on the 12th.August. It was a subsequent attack a few days later that did the serious damage. Mobile kit was installed near Bembridge to provide cover until repairs were completed.